How valuable do we really think health data is? How seriously do we take our responsibility to preserve the integrity of our health data? Probably not nearly as much as we should. Consider the current situation of most clinicians or organisations when purchasing a clinical EHR system. What do they look for? Many possible answers are obvious, but there is one question that I suspect very few are asking. 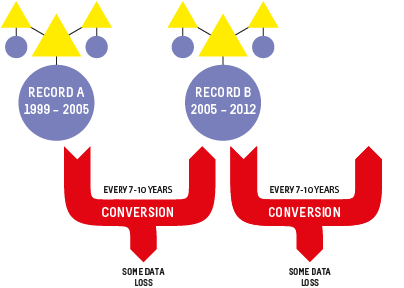 How many consider what data they will be able to export and convert to another format, preserving the current data integrity, at the end of the typical 5-10 year life span of the application? Am I wrong if I suggest it is not many at all? Despite all the effort that we clinicians put into entering detailed data to create a quality health record we don’t seem to often consider the ” What next?” scenario. How much and precisely what data will we be able to safely extract, export, transfer or convert into the next, inevitable, clinical system? Ironically, we are simultaneously well aware that clinical systems have a limited technical life span. Any and all of the health data in a health record is an incredibly valuable asset to the holder, to the patient (if these are not the same entities) and to those downstream with whom we may share it in the future – in terms of $$ invested; manpower resources used to capture, store, classify, update and maintain it; and not least the future value that comes from appropriate and safe clinical decisions being made upon the integrity of existing EHR data. Yet we don’t seem to consider it much… yet. However, as more clinicians are creating increasing amounts of isolated pockets of health data, we should be thinking about it very hard. Every time we change systems we put our health data at risk – risk of absolute data loss and risk of possible corruption during the conversion. The integrity of health data cannot be guaranteed each time it is ported into a new system because current methods always require some kind of intervention – mapping, transformations, tweaking, ‘cleaning’, etc. Small errors can creep in with each data manipulation and which over time, can compromise the safety and value of our health data. On principle we know that the data should not be manipulated, but being limited by our traditional approach to siloed EHR applications, we have previously had little choice. We need to change our approach and preserve the integrity of our health data at all costs. After all it is the only reason why we record any facts or activity in an electronic health record – so we can use the data for direct patient care; share & exchange the data; aggregate and analyse the data, and use the data as the basis for clinical decision support. We should not be focused on the application alone. Apps will come and go, but we want our health data to persist – accurate and safe for clinical use – beyond the life span of any one clinical software application. It’s. all. about. the. data. One of the key benefits of the openEHR paradigm is that the data specifications (the archetypes) are defined independently of any specific clinical system or application; are based on an open EHR architecture specification; and are publicly available in repositories such as the Clinical Knowledge Manager. It means that any data that is captured according to the archetype specification is directly usable by any and all archetype-compliant systems. Plus the data is no longer hard-wired into a proprietary application so that it is orders of magnitude easier to accurately share or transfer health data than it has before. Clinical system vendors that don’t directly embrace the archetype-technology may still ‘archetype-aware’, and can choose to use the archetype specifications as a means to understand the meaning of existing archetyped data and integrate it appropriately into their systems. Similarly they can map from their non-openEHR systems to the archetype specifications as a standardised method for data export and exchange. The openEHR paradigm enables potential for archetype-compliant systems to share the same archetyped data repository – along the lines of an Apple platform ‘plug & play’ approach, with applications being added, removed or updated to suit the needs of the end-users, while the data persists intact. No more data conversions needed. Now that’s good news for our health data. This entry was posted in Health Informatics and tagged archetype, CKM, Clinical Knowledge Manager, clinician, data, EHR, health information, openEHR, platform, universal health record by Heather Leslie. Bookmark the permalink. Hey this was what I’ve been telling since many years. Now people are trying to understand as there’s an opportunity to link different and big data sets by means of national/regional health identifiers. In New Zealand I’m working on a research project which aim to link together many different national and regional data sets – something most countries can’t even dream of. However in day 1 we hit data quality problem – especially around data integrity and different versions of data set where some parts of data do not conform to previous versions. We will use openEHR as the ‘canonical’ form to represent, link and query the many different data sets and with careful governance and use of CKM I’m hoping to eliminate or significantly improve the problem. Would you like to write this experience up – we can post it here? Hi Heather, do you have the name of the work/paper of Martin van der Meer, 2009, I need to user those diagrams in a presentation and want to add a reference t othe original work. thanks! Thanks, can I adapt your diagrams for a presentation?